This Week in Content Marketing: Does Dollar Shave Club's Content Launch Have Transparency Issues? 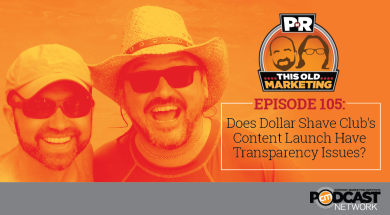 This Week in Content Marketing: Does Dollar Shave Club’s Content Launch Have Transparency Issues? In this week’s episode, Robert and I discuss several reasons why YouTube is poised to make a big impact in the streaming music business and what marketers can learn from its business model. Next, another pundit is hating on native advertising, but it’s not clear what he’s asking us to do instead. We come to a consensus on the terms that should be used to describe three types of paid placements. Dollar Shave Club has launched a new content marketing program called MEL, but Robert and I face off on whether its total lack of branding could be problematic. Rants and raves include The New York Times’ experiment with virtual reality storytelling and a Wharton article that “imagines” marketing is dead. We wrap up the show with a #ThisOldMarketing example from Fold Factory. Download this week’s PNR This Old Marketing Podcast . YouTube opens enormous music collection to all (5:47): YouTube has announced that it is making its massive collection of music available to its 1 billion users via a new iOS and Android app called (what else?) YouTube Music. YouTube Red subscribers not only get an ad-free experience, but can also save songs offline and can listen to music in an audio-only mode to limit its use of cellular data. Robert and I agree that YouTube has collected a huge amount of data on its users, which should help it deliver a highly personalized listening experience. Robert closes our discussion by outlining an important takeaway for marketers on treating each piece of content as a strategic asset. Can we kill the term native advertising? (15:37): Native advertising continues to be a hot buzzword going into 2016. But its proponents can’t even agree on exactly what it is, according to this opinion column on AlleyWatch by Roger Wu. In his opinion, native ads need to follow the form and function of the websites that are hosting them. Most so-called native ads fail this test. Although Wu makes it abundantly clear what he doesn’t like about native, Robert and I aren’t sure what he is advocating. We propose to clear up the confusion by clearly differentiating between content, promoted content, and native advertising. Dollar Shave Club launches men’s interest editorial destination (21:45): Dollar Shave Club, the online grooming retailer, has rolled out a new editorial project called MEL, becoming the next brand to try its hand at creating a media enterprise. MEL will begin as a twice-a-week newsletter including “one story we love.” A stand-alone website will launch in the near future. I love the email focus of it; building an addressable list is a key first step for any content start-up. But it doesn’t say Dollar Shave Club anywhere in the layout, which may cause problems with transparency. Robert disagrees, and explains why it’s best to start without any branding. Joe’s raves: I’m fascinated by The New York Times’ recent experiment in which it used virtual reality (VR) technology to tell the stories of three children who have been displaced from their homes by the war in Syria. An article from the Contently blog talks about the brands that are starting to experiment with branded VR movies, GE and MINI. As content marketers, I think it’s very important that we pay attention to this technology to see how it’s being used to tell stories. Robert’s rant: Robert is appalled that this opinion piece on Knowledge@Wharton attempts to use John Lennon’s iconic song Imagine to justify an argument that marketing is dead (“Imagine there’s no marketing/It’s easy if you try…”) and social media is the future. Robert’s rebuttal is that companies will always put content, advertising, social media placements, and other messages in front of consumers to shorten the time to purchase. 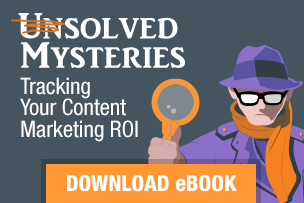 Marketing isn’t dead; it’s just continuing to evolve. Fold Factory: Trish Witkowski is the founder and “chief folding fanatic” of Fold Factory, a small business that sells die-cut and folded direct mailer templates to brands and agencies. She has created a lot of visibility and new revenue for the company by publishing the 60-second Super-cool Fold of the Week video show on YouTube. In these simple videos, she shares creative mailer designs from around the world. She wears a different T-shirt each week with an amusing folding slogan. She is now on episode 317, which means she’s been doing these videos for more than six years. Her YouTube channel has over 1 million views and more than 4,200 subscribers. Revenue spin-offs include T-shirt sales, a Fold Club membership program, and sponsorships from major companies. Fold Factory is a terrific small-business example of #ThisOldMarketing.